Having already proven itself on land and in the air, ERA Environmental Management Solutions is poised to set to sea by working with Vigor Industrial, the leading provider of shipbuilding, ship repair, and marine & fabrication services in the Pacific Northwest. 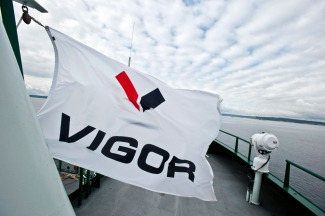 Vigor builds and repairs a wide range of ships, including ferries, barges, fishing and cargo vessels, workboats, tugs, as well as U.S. Navy aircraft carriers and U.S. Coast Guard icebreakers. It even applies specialty finishes and builds alternate energy platforms. A bustling company like Vigor needed a robust environmental management system that could keep up with it. Vigor takes a community minded approach to everything it does, from environmental responsibility to strengthening the communities around it. Vigor already knows the importance of environmental sustainability and ERA is excited to help Vigor get its environmental compliance done faster, more effectively, and with less stress. "We do all our work with the utmost regard for our environment. We are good stewards, improving the ecology of the areas we inherited from a different era. We believe that steel and green can, do and must coexist."